Most of the residents at my workplace also try to check out my nails (as well as my sister's nails) to see what we happen to be sporting on them.. There is one group in particular that ALWAYS makes sure to check.. And I happen to know that they HATE when I sport green nail polish.. 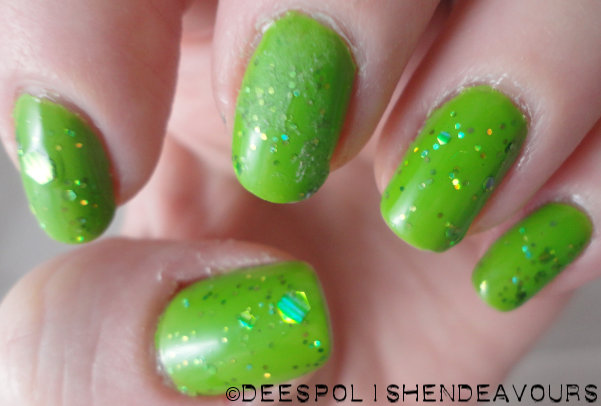 Which is awful (for them) as green is my favourite colour and I happen to love sporting green nail polish. So.. What did I do? I went green on green. This is two coats of Sally Hansen Complete Salon Manicure Grass Slipper, followed by two coats of NYX Enchanted Forest. Oh, and please ignore my middle finger nail.. I had (have) a vicious slash on the side of my finger.. The bandage that I was wearing decided to leave residue behind - that only went away with nail polish remover. Le sigh. These two polish were actually sent to me by two gals involved in my birthday group. I have been meaning to publish a post about it all - but I had been waiting for one other package.. I seriously doubt it will ever turn up.. So I think I will do a bit more work on that post, then I will be able to share all its awesomeness with all of you!